Stacy Tilton Reviews: A Mother's Day gift for me? Yes please! A Mother's Day gift for me? Yes please! You might have read my title of this post and then looked and the images and said "what?" is she nuts. Well let me explain a little. I'm a bit of a vacuum cleaner addict. (Now you're really saying "WHAT!?". Over the years I've had several different vacuum cleaners - some I got because we used to have a carpeted house, and then some because we moved to a house with hardwood floors. As you may know it's very hard to find a vacuum that does well on multiple surfaces, and is easy to carry up and down stairs. Our house is a tri-level so that factors in to the equation too. At one point I actually kept a vacuum upstairs in my bedroom because I was tired of carrying one up and down the steps all the time. There was even one point where I had five different kinds of vacuums in my house all at the same time. You know one for pet hair, one of hardwood floors, a lightweight one for the steps, and one that had the removable hand vac for hard to reach places. So when I say "Yes, please" to the thought of a new vacuum to try out maybe now it makes a little more sense. 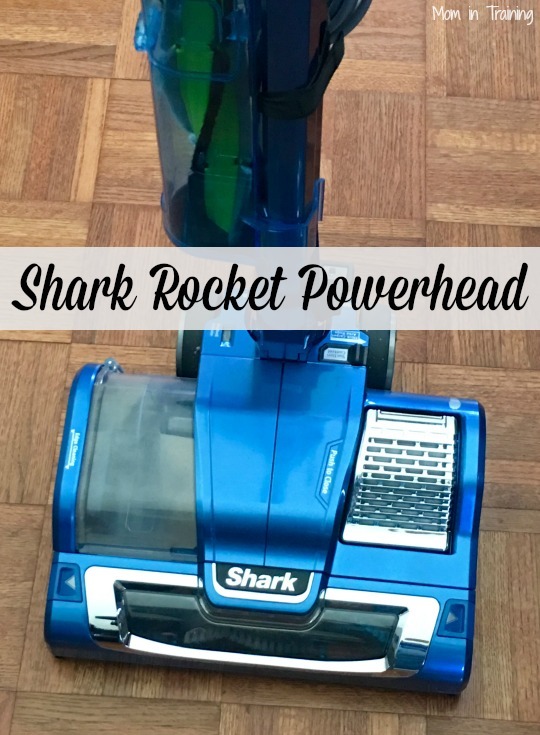 Recently I had the opportunity to actually try out the Shark® Rocket® Powerhead and I have to say I'm really liking how versatile it is. First off it's super lightweight so It's very easy for even my kids to carry up and down the stairs. It has interchangeable brushrolls so that I have one specifically for my hardwood floors, and one for our one big room with carpets. And to top it off, it does a wonderful job on my floors. It's so easy to maneuver you can do it all one handed and your arm not get tired. I really like that the controls are at the top of the handle so they are easy to use. I have to say this might be one of my new favorites for everyday sweeping jobs. Oh me too! That looks so nice! I love that it only weighs nine pounds, and only one pound in hand! Great that it goes from carpet to floor too! I like the idea of interchangeable brush rolls. They are a pain to clean. This would make a great Mother's Day gift for me too! I love that it is less than one pound in hand! I was so excited about my first Shark machine. It was a floor steamer. Unfortunately, it stopped working within months of purchase. I hope they've improved their durability.